Another downside of directly landing in Northern Germany is the supply issues that Allies have to undergo. Supply: The first thing the landing has to do is get a port to get supply level 3. Landing in France in 1944 all the ports are forts and are sometimes hard to capture, landing in Northern Germany the only port, Wilhelmshaven, is not a fort! Seem like it might actual be easier to get supply in Northern German? Overall, I still think landing in Northern Germany is a better place for a 1944 D-day? This is not as important in 1944 because the Allies will have Mulberry supply (Level 2) in the invasion area. It's quite easy taking Cherbourg if you cut-off the peninsula. Rennes in a supply Source as well and not a fortified city. Remember that the Coastal cities are NOT fortresses, but rather fortified cities. The defense bonus is quite a bit less than fortresses. The only true fortresses in the game are Sevastopol, Liege and the Maginot line. 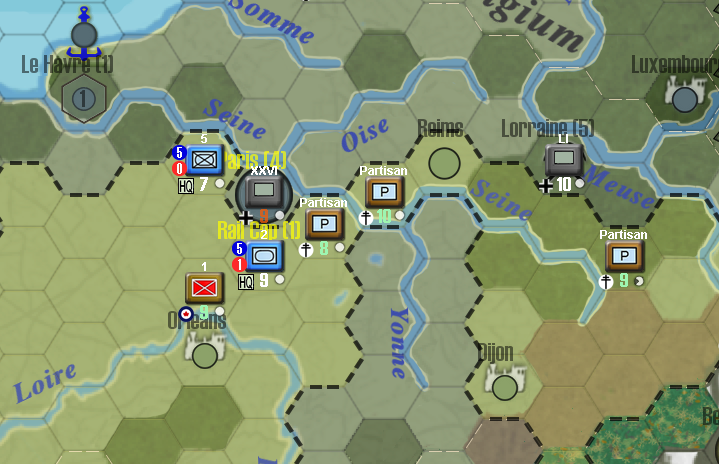 Liege is converted to a regular city in a fair weather turn when the Germans have paratroopers available. In order to succeed with the invasion you need to prep the area you want to invade. 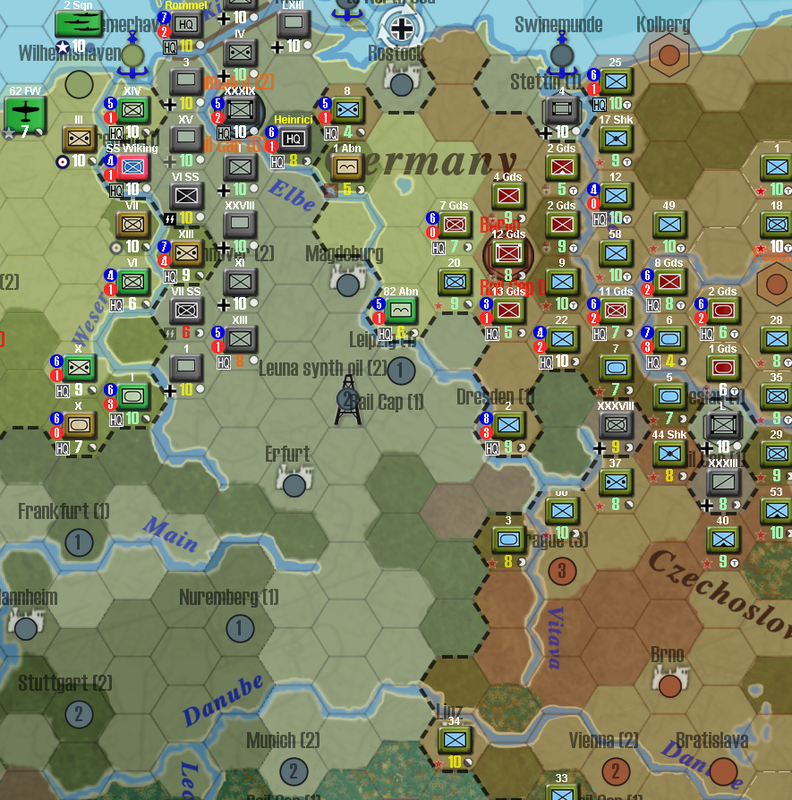 E. g. Cherbourg can be bombarded every turn for some time to deplete the unit within. You can even shore bombard the unit there. If you use Strategic bombers on Cherbourg you can drop the instrinsic strength so low so the defenders can't repair if cut-off. Paratroopers are very good at screening the invasion area so the Axis can't threaten the beachheads. Vokt wrote: After having to bitterly fight to overcome the German stiff resistance in the Dnepr, Soviets had had their reward. Furthermore, given the high losses suffered by the Wehrmacht at the Dnepr and during its withdrawal, they didn't expect to encounter strong Axis defending forces in Poland. So the Soviets, although several turns ago were a bit behind schedule, now they shouldn't have major problems to reach Berlin in time. That is good to see. 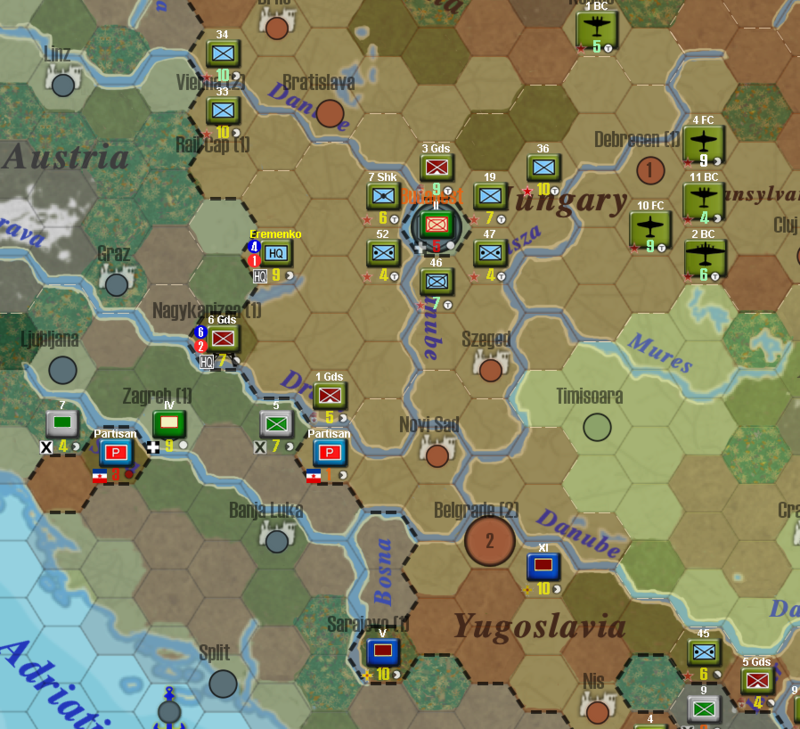 I think the Axis player does better to force the Allies to fight across river or into bad terrain as much as possible. If Your defense line is breached then it can be too costly to restore the defense line again. The reason is that after Your attacks you have quite a few depleted units near the front line which can be crushed in the next Allied attack. The war in Russia is actually a meat grinder. Russia have more units than they can use. Their job is to destroy as many German steps per turn as possible. If the Axis Counter attack a lot then you just help the Russians reach their goal. It doesn't matter than you destroy some strong Russian units in the process. They have enough units anyway. 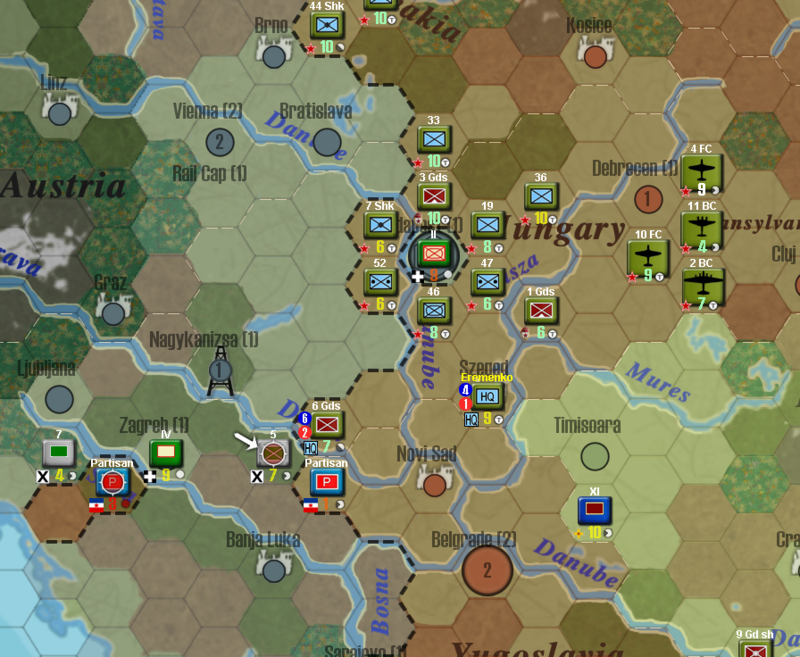 This game shows what happens when the Axis can't hold a defense line anymore. I think that it's better for the Axis to abstain from Counter attacks and rather repair losses every turn (or retreat) unless the hex you attack is really Critical and the odds are very good. The goal is that the front line should always be with 10 step units at the end of Your turn. If you can't achieve than then you run. If running isn't possible because the pursuing units are faster then you sacrifice some units to let the others get a chance to withdraw. Thanks for your reply; You made some good points and I never understood the Mulberry rule, so thanks for explaining that. Maybe that is what Vokt meant about supply in Northern Germany. Actually in 1944 it's typically impossible to place German fighters and even tactical bombers in such way, that they reach Normandy, while staying outside of Allied fighter direct attack range. What can't be reached from England will be in range of fighters and carriers, operating in the Med. Usually Allies don't have many fighters in the Med, so there will be couple relatively free turns for Axis airforce to operate, while Allies redeploy fighters. After that Luftwaffe getting obliterated no matter what. 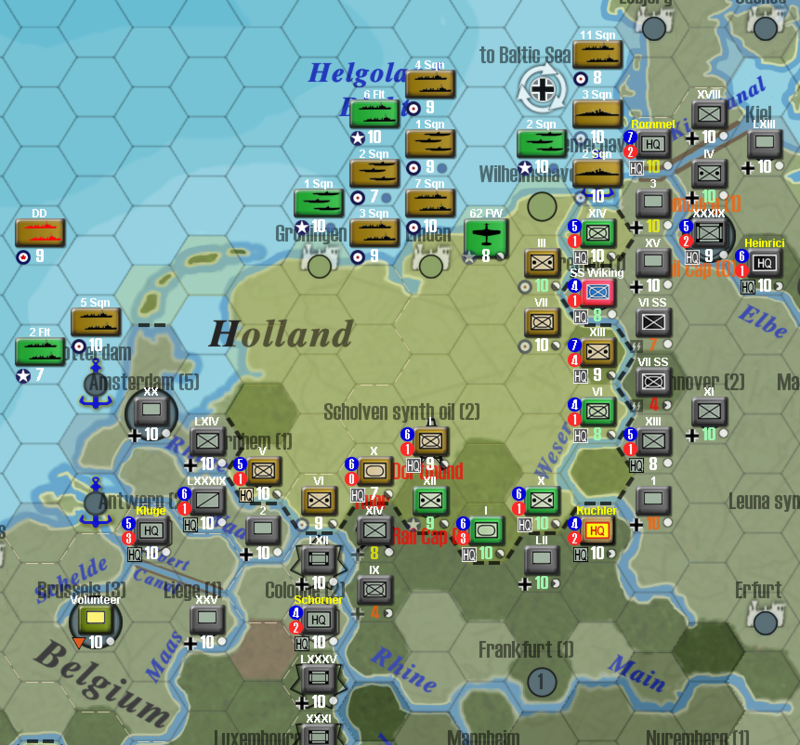 In this game Allied landing in Holland/Germany actually allowed Luftwaffe to last a bit longer and land some good hits. Even unescorted 2-3 step bomber does good morale damage to paratroopers, for example, as they have no flak and are outside of fighter cover range. Western Front late Summer-Autumn 1944. We left it here with US-UK forces consolidating and expanding their respective beahheads by August 1944. It seemed like a good start and that, with some luck and good weather, Western Allies could even think in a fast campaign in Northern-Western Germany, and so to seize a lodgement good enough as for going for the kill in the Spring of 1945. The fact was that Germans, poised to strongly contest the landings, were able to gather more units than the Western Allies could imagine. 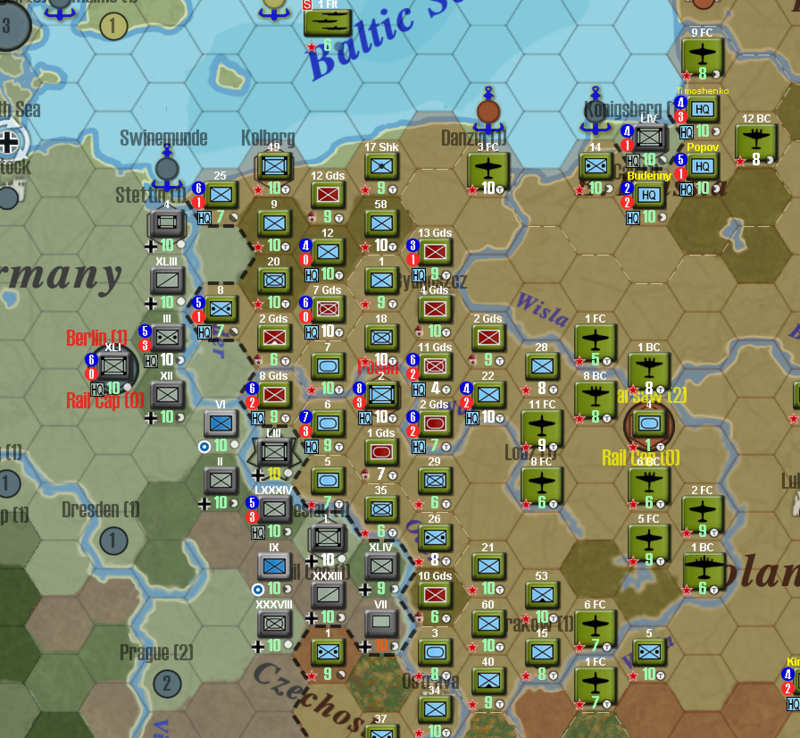 In 2-3 turns, plenty of Wehrmacht units (some of them good quality units) arrived to the front, completely ruining Allied hopes for a fast campaign. This way, US-UK units progress got stalled. To this it would have to add that Germans felt strong enough to launch some effective counterattacks no matter the scarce air support with which they counted (RAF-USAF had achieved air supremacy by late Summer). At least, Western Allies were able to destroy some several good German units: e.g. 2 more panzerkorps units (one of them I SS PzK) were killed in Holland before bad weather arrived. Mud came in turn 95 (October 24, 1944). Still, Allies didn't completely stopped their activity. 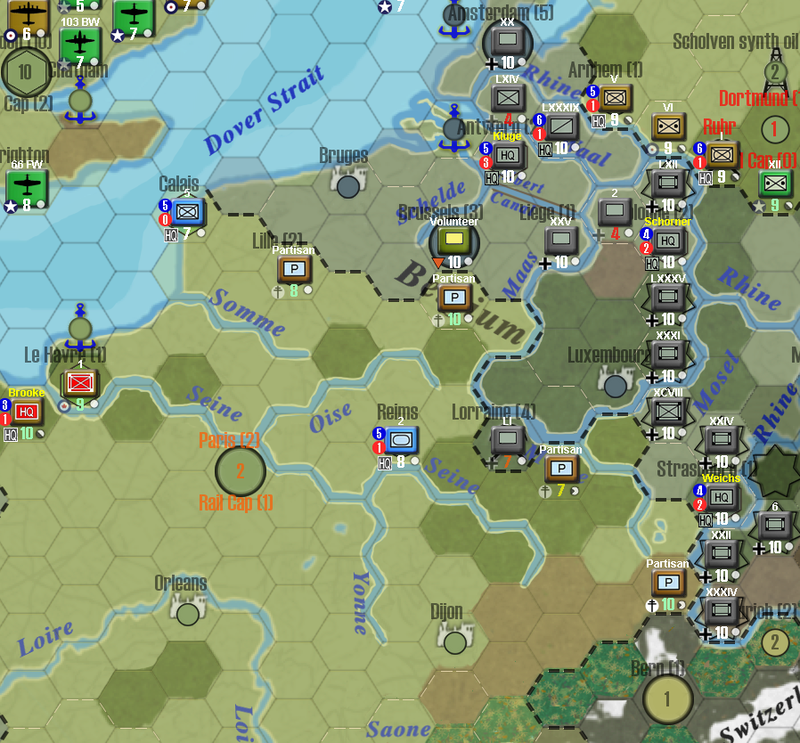 With the ample support of the numerous TAC's based in England, they managed to destroy 1-2 Wehrmacht units per turn. Shot is before Allies moves. You can see that by that date, the Germans had already formed a double defensive line. Furthermore, good commanders (like Manstein attached to LXV AK 1xNW of Hannover) were leading Wehrmacht units. As a sample of how Allied advance got stalled, in Allies turn 96, Allies were only able to kill XXXV AK (garrison guarding Scholven synthetic oil plant) and XCV AK (moto) 2xNE of that spot. Allied landings had failed: to get to Hamburg would be really difficult, let alone Berlin. Only good thing was that Western Allies were keeping the Germans from using their most powerful units vs the Soviets. In January 12, 1945 (turn 99) a Wehrmacht counterattack in the Wisla drove the Soviets back to the eastern bank again. It seemed like the Axis was going to offer some resistance along the river. Anyway, in Allies reply, Red Army crossed again the river and formed a new bridgehead 3xSE of Lodz and it was the Germans who this time were forced to retreat. That was how things were unfolding in Poland. In Hungary and Romania it was a completely different thing: in these countries, Red Army was advancing totally unopposed. 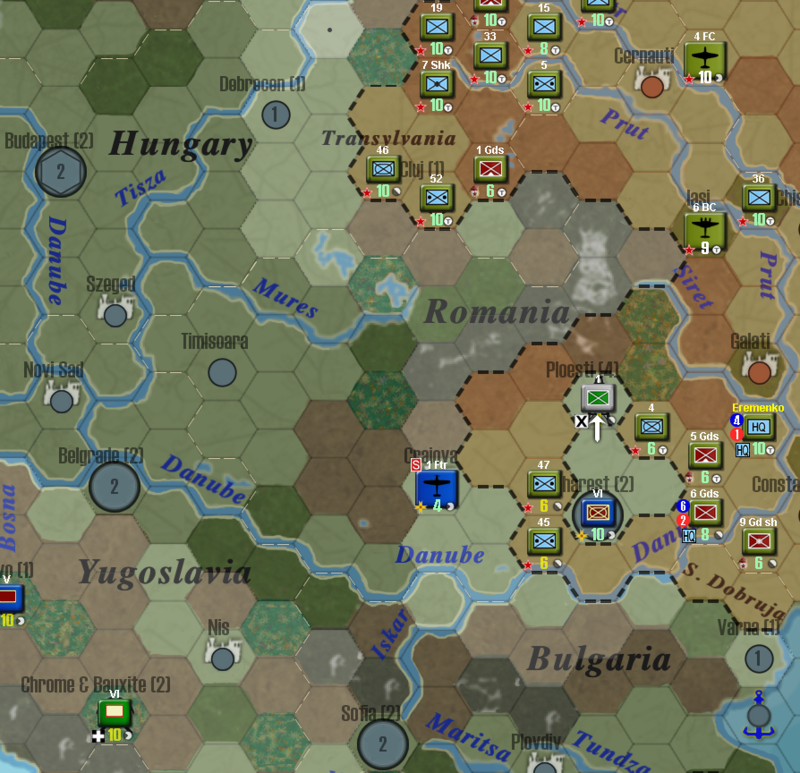 In Hungary, some Soviet units had crossed Carpathian mountains and were ready to invade this Axis minor country. In Romania, Bucharest had been already reached and it was now completely surrounded. Shot is taken before Allies moves. In Allies reply, Soviets were going to cross the Wisla for good. Vassilevsky's 6th Tank Army led the attack to retreating German units some of which were finished off. Warsaw itself was attacked but held. In Hungary, Cluj was taken and in Romania, Bucharest held at minimal strength. February 21, 1945 (turn 101). Weather changed to mud in central. More German and Finnish armies retreats. Finns, who had retreated all the way from Novgorod front to Poland, were helping the Wehrmacht on its defensive efforts. In Allies turn, mud didn't stop the Red Army from taking both Warsaw and Bucharest. VVS units operating from Winter weather hexes much helped in that. Soviets didn't expect a strong Axis resistance in Poland and Wehrmacht prompt retreat from the Wisla had proved right that forecast. It was Winter weather in central in that turn. You can see from the shot that Allies had landed in Denmark directly from Wilhemshaven port. Although, chances there were slim, at least it may put some additional pressure on the Germans. 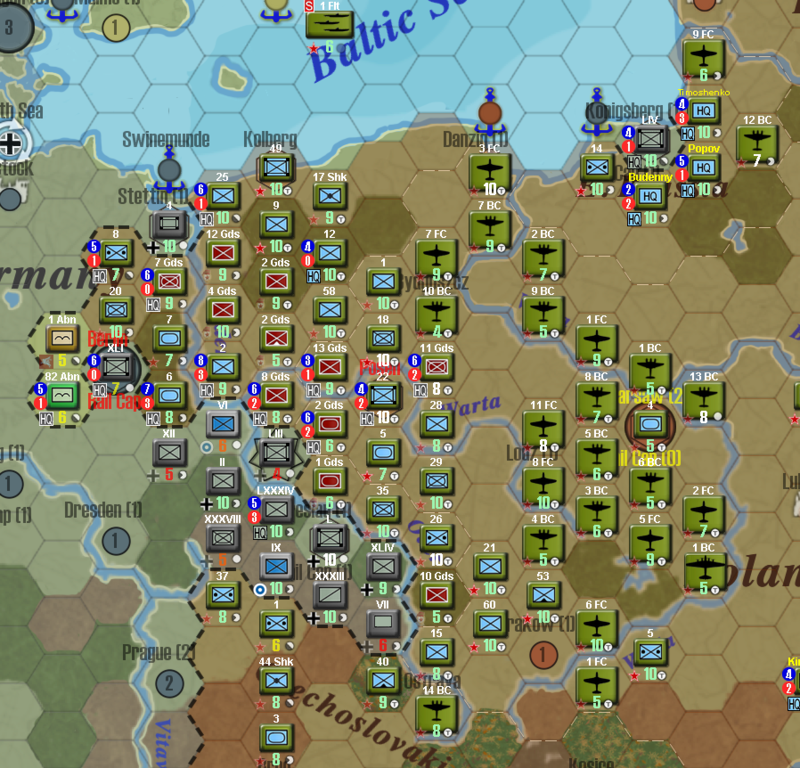 You can also see that Wehrmacht opposing forces are quite strong: 8 mechs (3 of them elite) and 2 panzerkorps meant a quite formidable obstacle to overcome. Referred forces could even pose a threat for the Allies, since once fair weather arrived in Spring, it would the Germans who would strike first. In France, Free French forces along with the Canadians, were preparing for the first round of attacks on Paris, that would occur once fair weather arrived. 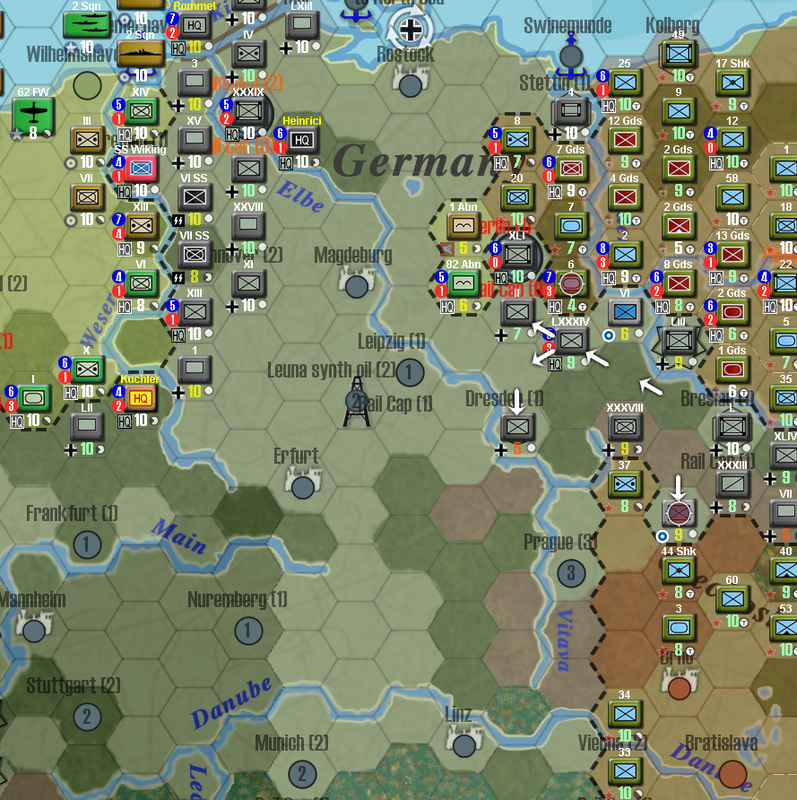 Allies, for now, could only expect to keep all of those potent German units from being used in other fronts. After seizing Warsaw and after fair weather in central came to stay (it did on turn 102, March 13, 1945), Red Army entered central Poland and there was nothing that Axis forces could do to stop them. 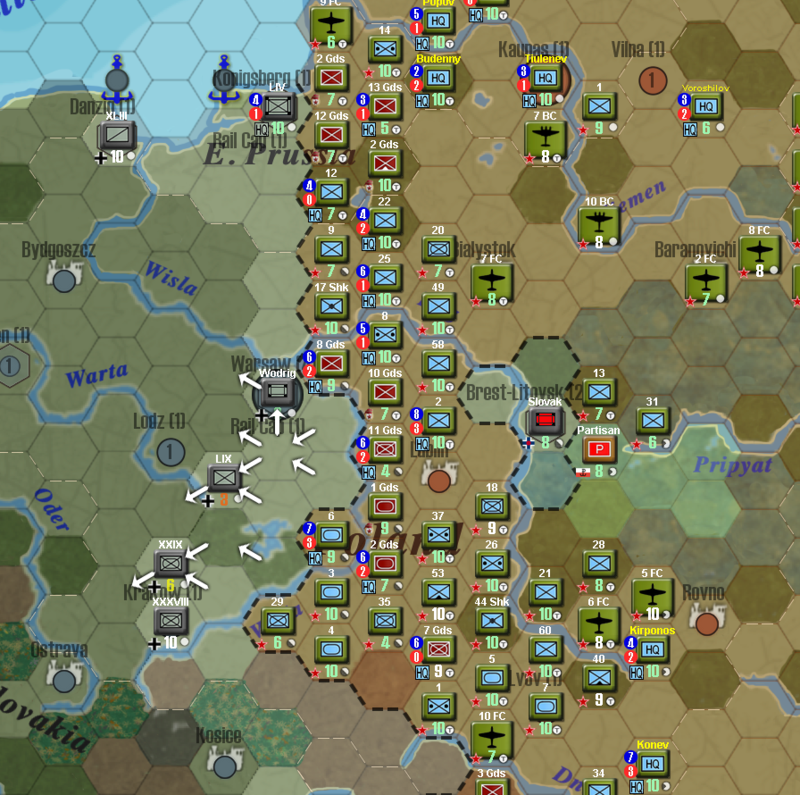 Soviets, many times taking advantage of the exploitation movement due to retreated or killed enemy units, advanced really fast and some Red Army units even reached the Oder right on this March 1945 turn. In Hungary, Red Army made its first attack on Budapest which held rather well. April 2, 1945 (turn 103). In Axis turn, there was a Wehrmacht counterattack targeting Soviet 4th Tank Army, Allied unit surviving at very low strength (1). In Allies turn, Red Army entered Posen and made several attempts to cross the Oder, that failed. German counterattack and heavy resistance proved that, in the Oder, things were going to be harder than in the Wisla. To make things a bit duller for the Soviets, Budapest held again vs a potent attack. April 22, 1945 (turn 104). This was going to be a decisive turn. This time there weren't counterattack from the Germans which totally focused in the defense along the Oder. Only Axis offensive activity was from Bulgarian army vs partisans in Yugoslavia. In Allies turn, Soviets determined to launch a big offensive in the Oder E of Berlin, sort of bypassing Breslau sector in which Germans were quite strong. Powerful Red Army units in Eastern Germany were upgraded and refitted for the offensive and tons of VVS units that had been rebased to Poland, were ready to provide massive air support. Finally, US-UK armies, still engaged with the potent Wehrmacht forces in Western Front, wouldn't be able to provide tanks for the offensive in Berlin but they would provide paratroopers for a support airborne operation. Below are shots of how things unfolded in Eastern front in this turn. You can see from the shots that Soviet offensive was quite successful, Red Army overrunning German defenses at the Oder. As a result, German XLIII AK (cavalry) and III AK (motorized) were destroyed whilst Finnish VI Corps and German XII AK were halved. Berlin itself was attacked. Good performance of Soviet elite units (like Chuikov's 7th Guards mech Army) allowed for this good outcome. In other sectors, Vienna was taken whilst Budapest, stubbornly, held. Soviets had walked more than half way to take Berlin. As expected, once fair weather arrived, activity much increased in this front. 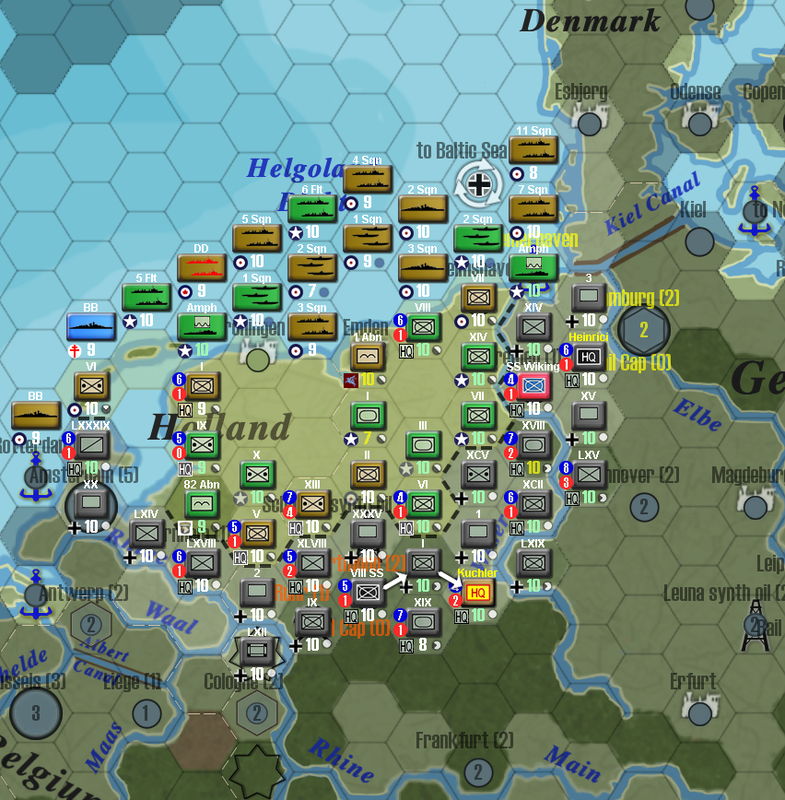 In March 13, 1945 (turn 102), German started to launch effective counterattacks vs Allied beachheads in Denmark: in a matter of 2 turns, they succeeded in removing the landings, thus ruining any Allied hopes for a thrust to Hamburg from there. Western Allies, in return, started to kill one by one, all of those Wehrmacht heavies that were threatening the main landings in Northern Germany. This way, in turn 102, they destroyed Guderian's XIX PzK and entered Arhem by killing the defending HQ LXVIII AK. And in turn 103 (April 2, 1945), in another push, they succeeded in killing XVI PzK, a veteran unit, 2xW of Hannover and they crossed the Weser river, SW of that city. Among other Allied units, Germans destroyed US III armoured Corps and they sort of broke through Allied lines in the Ruhr. With this last Wehrmacht offensive effort, the Germans had denied US-UK armies any chance of getting to any of the Germany capitals. A total of 6 Wehrmacht units (3 mechs, 1 motor, 2 corps) were going to end killed as a consequence of US-UK armies attacks, amply supported by their air forces. Dortmund was taken. Meanwhile, in France, attacks on Paris had started in March. At first, the city held well but later and due to increased air support and the Allies obtaining full supply after the seizure of Vichy, German resistance started to weaken. Shot below is from turn 104 (April 22, 1945), before Allies turn, in which, Free French forces were finally able to enter Paris. 1945 started with 2 forts of the Gustav Line still standing. This was indicative of a really slow Allied progress here. Anyway, Allies were able to breach a 3rd fort right in January 12, 1945 (turn 99). In February, attacks on the remaining fort, defended by a 4-stars xp German paratrooper division, commenced. Referred Axis unit was quite supressed due to continous naval and air bombings so it couldn't resist the attack done in March 13, 1945 (turn 102) and it was destroyed. After a long fight, Allies had now Rome at reach. 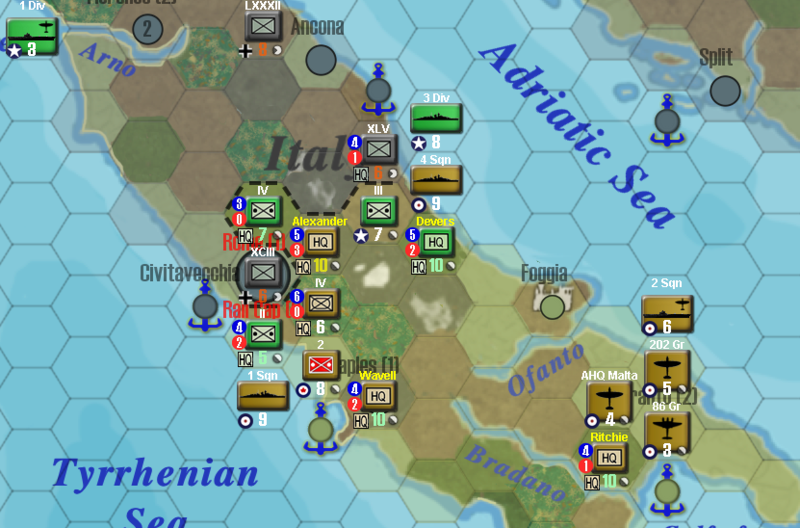 After the corresponding approaches to the Italian capital, Allled launched furious attack on April 22, 1945 (turn 104). Although barely, the city remained in Axis hands. It would have to wait for last turn to take Rome. May 12, 1945, last turn. The shot above is before Allies moves for you to see dispositions of forces previous to last big Allied assault on German capitals. You can see in the shot above, took at the end of Allies turn, how Axis forces around Breslau, which 3-4 turns ago were quite strong, were very much reduced due to the strong Red Army offensive. Referred city remained in German hands though. You can also see that Hamburg was left untouched. All that Western Allies could do was to cross the Weser river in two spots and to advance a little in the forested terrain N of Frankfurt. 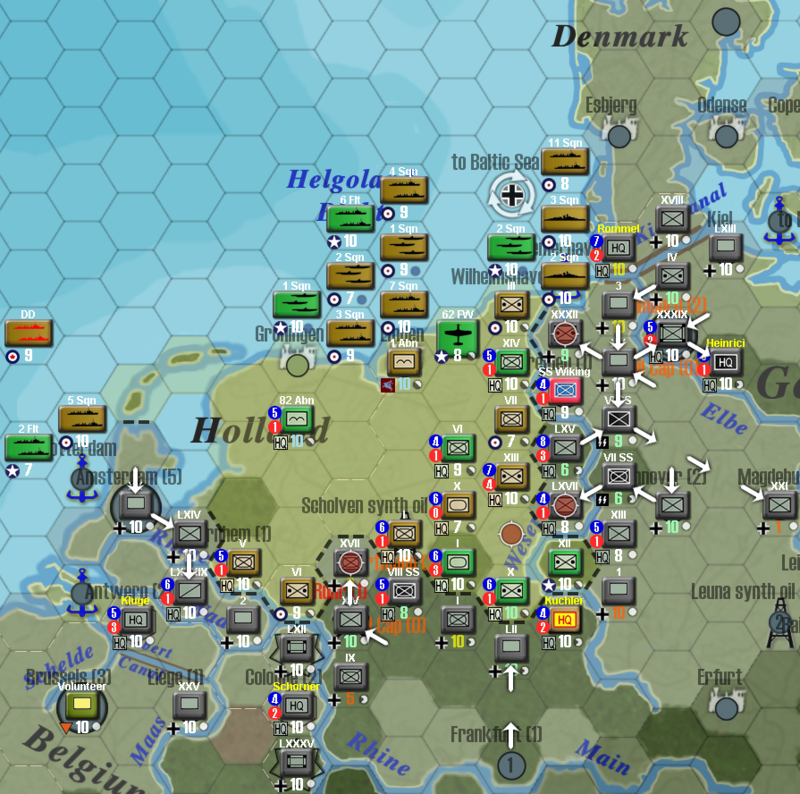 So without Hamburg being taken by the Allies, the game couldn't end with an Allied victory. But at least it could end in a stalemate if Allied armies in Italy succeeded in taking Rome. 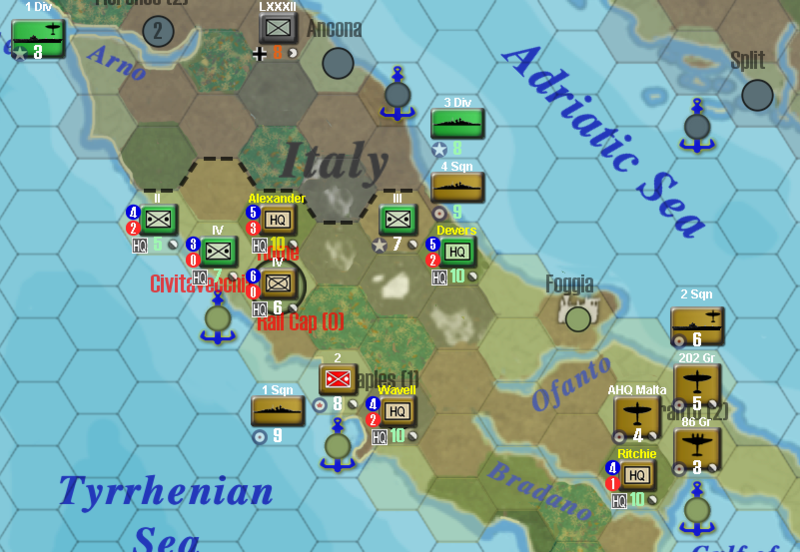 Below are last turn shots of Italian front, before and after Allies moves. Defending German XCIII AK in Rome, although repaired in Axis turn, was very weakened and unlikely to held vs Allied attacks. McCreery's IV mechanised Corps entered the Eternal City. It's a little bit harder for the Allies in 4.0. You cannot gamble that much with them now. Game is more interesting. You need to take all Capitals on turn 104 or earlier to get Allied victory. If you fail to take all Capitals on turn 105 then it's an Axis victory. 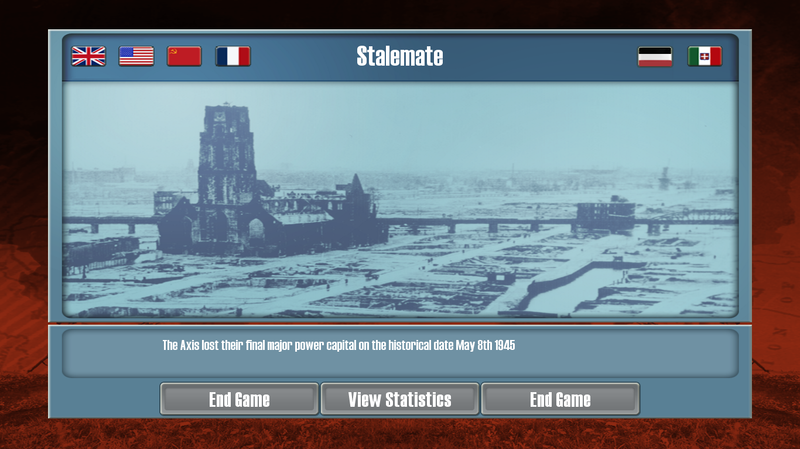 Stalemate means you were able to replicate the historical result, i. e. the Axis surrendering around May 8th 1945. I still remember that If Axis will be able to hold one of its capital ( Rome , Berlin , Humburg), it will be Axis minor victory . Is there anything change ? Only the primary Capitals are counted. 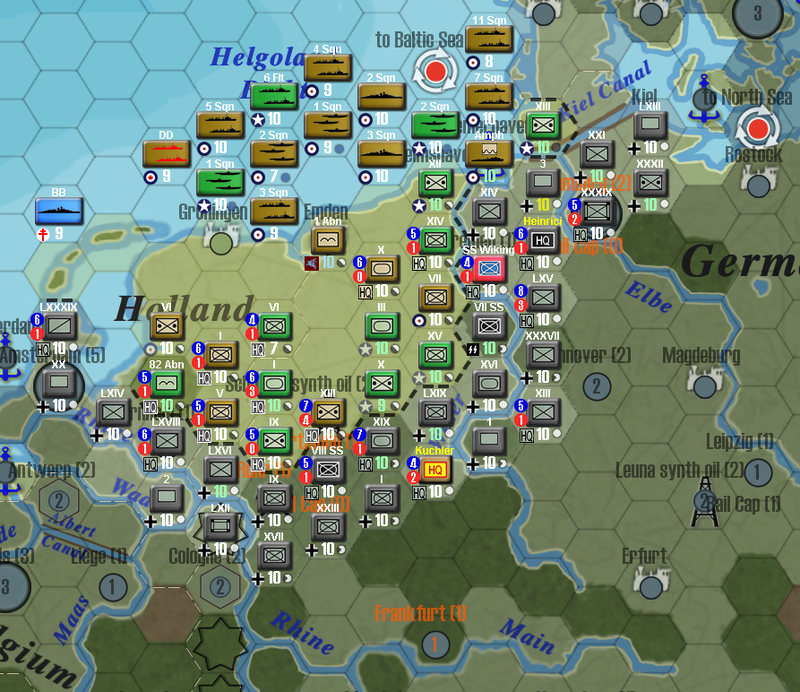 However, Axis Control of Hamburg will prevent Germany from surrendering so you have a chance to liberate Berlin and prevent a loss. However, in the final turn you don't get that chance since the game ends anyway.